Stone Designs & Marble Products Ltd.
You will experience a warm and friendly atmosphere and excellent customer service at Stone Designs. Stone Designs is a dynamic company whose aim is to change the way natural stone (granite, marble and quartz) are fabricated using cutting edge technology. 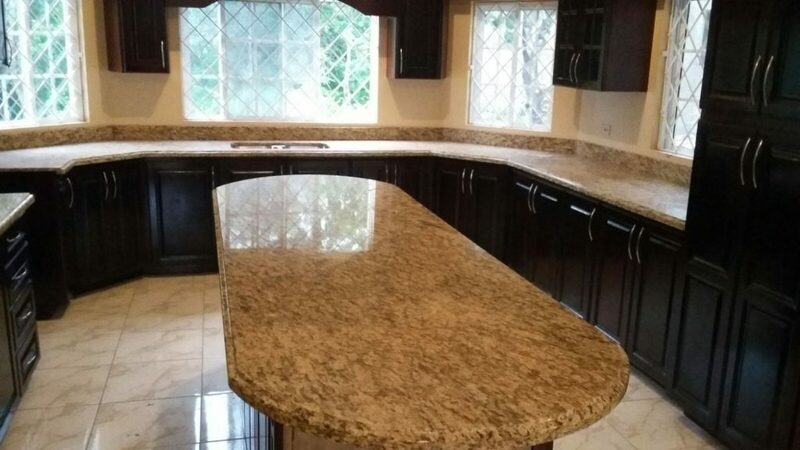 With over 10 years of experience in the industry, Stone Designs & Marble Products Ltd is your exceptional stone manufacturer for quality granite, marble and quartz countertops in Jamaica. At Stone Designs you will experience friendly and courteous customer service, efficient delivery and quality craftsmanship. Our countertops are custom made – whatever your design, we are equipped to produce same with precision, we put care into every detail of your countertop experience. Our goal is to effectively serve all your stone needs. We have a team of dedicated, skilled craftsmen and women whose aim is to deliver quality and satisfaction to every customer at affordable cost. We are centrally located in Manchester, Jamaica but our services extend across the length and breadth of the island. Our professional team will meet you where you are. We offer a vast array of colours for your choosing; and although stone countertops are our speciality we do offer Kitchen and Bathroom Cabinetry, as well as fixtures for residential or commercial spaces. Hi, how may we be of assistance?